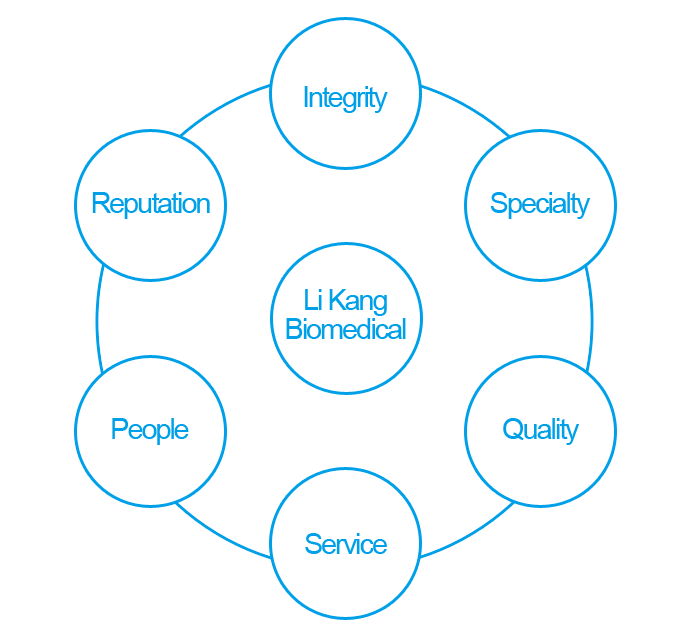 The business principle of Li Kang Biomedical consists of 3 “Persistences” and 3 “Enhancements.” We, Li Kang Biomedical, all believe in and implement thoroughly. Persistence in Integrity: Li Kang Biomedical is a factory owner that operates tourism factories, product consulting and telemarketing for our customers. For the long-term partnership, we must take trust as the basis, no exaggeration or cheating. Persistence in Professionalism: Possessing the profession is the fundamental of the company; deepening the profession is even the motivation for growth of the company. Li Kang Biomedical operated with profundity by choosing the decentralized channels. Only by showing our specialty can we succeed in the industries. Persistence in Quality: No matter if it is physical product quality or the invisible service quality, Li Kang Biomedical never falls short of the self – discipline for quality. The building the internal quality management and external quality certification shows that Li Kang Biomedical persists in quality. Enhancement in Service: For Li Kang Biomedical, striving for the service standard never ends. Only when consumption performance reflects continuous upgrade of service quality and increase of consumer satisfaction, the business owners may be satisfied with our service. In this way, our company will lead to positive circulation. Enhancement in Talent: Talent is the only element that limits the company boundary. Li Kang Biomedical has a complete cultivation program for the talents. We follow the planning direction of the program to implement the educational training and practical exercise. We hope to bring up responsible managers for pioneering new opportunities and creating plentiful profits. Enhancement in Reputation: Reputation is the great asset of the corporation but also the best marketing tool. All the employees in Li Kang Biomedical take maintaining reputation of company as their responsibility and do the post conscientiously. We believe that the efforts today make the honors tomorrow.